Man, I love it when gear manufacturers build stuff for a cause! Wampler has just re-released their limited run Underdog Overdrive (only 100 were originally made) to help out a friend who has breast cancer, as she can’t pay her doctor bills and apparently can’t get any insurance. All the profits from this re-release are going to help this woman out. It’s great to see this type of generosity! 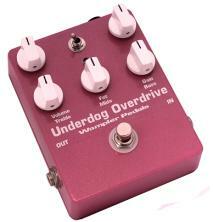 Wampler Pedals has recently re-released their popular “Underdog Overdrive” pedal. Only 100 of the pedals were built originally. For more information, visit the Wampler Pedals site!